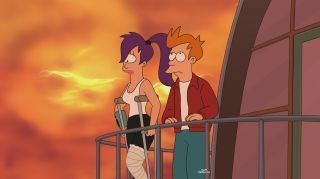 Fans of the animated sci-fi TV show "Futurama" get a rare treat tonight (July 11), as the show's creator and some of its stars will host a half-hour chat that will be webcast live. "Futurama" creator and executive producer Matt Groening (who also created "The Simpsons") will participate in the event, which is called "Futurama Live!" and takes place at 10:30 p.m. EDT Wednesday (0230 GMT Thursday). It follows the airing of the Comedy Central series' latest episode on the East Coast. Also taking part in "Futurama Live!" are fellow executive producer David X. Cohen and voice actors Billy West, John DiMaggio and Maurice LaMarche. The group will talk about Wednesday's episode ("Zapp Dingbat," featuring a cameo by "Star Trek" actor George Takei), answer fan questions and preview future episodes, Comedy Central officials said. The event will stream live on Comedy Central's "Futurama" page, the show's Facebook page and Ustream. Fans can submit questions via Facebook, @ComedyCentral on Twitter or at Answerama, the show's page on the Sci-Fi & Fantasy Stack Exchange. They can also submit "Futurama"-themed art that may be featured on the webcast, and fans will also have a chance to win special prizes, officials said. "Futurama" centers on Philip J. Fry, a 25-year-old pizza delivery boy who accidentally freezes himself on New Year's Eve in 1999 and wakes up 1,000 years later. Fry finds work at an intergalactic delivery company called Planet Express, which is run by Professor Hubert J. Farnsworth, an eccentric, 160-year-old scientist who also happens to be Fry's great-nephew, going down 30 generations or so. Planet Express has several other employees, including Bender, an attractive female cyclops named Leela and the incompetent Dr. Zoidberg, a lobster-like creature with a lousy grasp of human physiology and anatomy. West voices many characters, including Fry, the Professor and Zoidberg. DiMaggio and LaMarche voice Bender and the amphibious creature Kif Kroker, respectively. "Futurama Live!" will begin at 10:30 p.m. ET on Comedy Central's Futurama website, as well as the show's Facebook page and on Ustream. You can submit questions through Twitter at @ComedyCentral and Answerama.